It will not be the defense, it will not be the history, it will not be the running game or wether when USC plays Notre Dame. The only comparison that will matter is the goldenness of the quarterbacks for the teams. 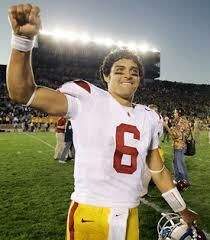 While Jimmy Clausen claims to be the golden boy from SoCal. 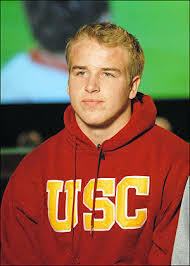 the photographs clearly demonstrate that Matt Barkley is much more golden. No question, USC over Notre Dame. 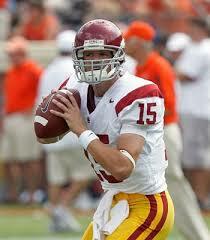 As previously predicted here on Dreadnaught, Aaron Corp will get the start at quarterback for USC against Washington. Matt Barkley is still suffering from the bruised shoulder he suffered during the win over Ohio State. USC quarterback Aaron Corp has been chosen to start the Trojans’ Pac-10 opener against Washington on Saturday, a person briefed on the decision told ESPN’s Joe Schad on Friday. Freshman Matt Barkley is expected to regain his status as starter when he is healthy enough to resume throwing, the source said. Barkley continues to experience pain in his bruised right (throwing) shoulder, which was injured in the third-ranked Trojans’ 18-15 victory at Ohio State last weekend. Nobody will need to remind USC coach Pete Carroll what happened last season when the Trojans were feeling good after beating Ohio State. They came out flat in the first half in the Pac-10 opener at Oregon State, and could never catch up, losing 27-21—the only blemish on USC’s season. Once again, here are the Trojans, coming off an 18-15 win at Ohio State, ready to go on the road for their Pac-10 opener. This time, it’s against Washington, which ended a 15-game losing streak last week by beating Idaho 42-23. Update: Corp did not have a good game. Washington played very well. Not a good day to be a Trojan. We shall see who makes the start in Seattle. While on the topic of USC quarterbacks, it appears one QB may start at another position. The starting punter position is open, and it looks like Mitch Mustain may be just the man for the job. Best of luck to Mustain, he is a stud for coming to the Trojans with so much hype and being willing to do whatever it take to help the team. Note: If you are a USC football fan, you must read USC BLOG, TrojanWire, and inside usc. This Saturday the Trojans face Washington. The question remains who will start for USC at quarterback? To answer this question one must look back at the quarterback competition at SC. Coming out of spring practice Aaron Corp was named the starter by Coach Pete Carroll. Corp then cracks his left fibula and Matt Barkley is named as the starting QB. Barkley then starts against San Jose St. and stuns everyone in the come-from-behind victory over Ohio State. 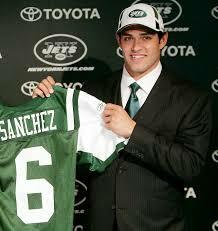 Former Trojan quarterback, and current Jets QB, Mark Sanchez has nominated for NFL Rookie of the Week. Go here to vote and check back Friday afternoon to see who wins. Sanchez recorded the third most passing yards for a rookie in Week 1 in NFL history, completing 18 of 31 passes for 272 yards, one touchdown, one interception and a passer rating of 84.3 in the Jets’ 24-7 win over the Houston Texans. Sanchez led a Jets offense that gained a total of 462 yards and controlled the ball for nearly 39 minutes. So much for Coach Carroll not being happy about Sanchez leaving, it did leave the job open for Matt Barkley. Los Angeles-Not that Pete Carroll expects Matt Barkley to suddenly go Todd Marinovich on him, but the USC coach said he met with the freshman quarterback Monday night to see how he’s handling life in the national spotlight. “We sat down last night and talked about how Matt’s handling the attention and the constant questioning and all that stuff,” Carroll said. “There’s an innocence there that it’s great to see. He’s having fun. This does not change who he is. He clearly stated that and understands that. But we have to keep in contact with that. You know, stay around and hang with the people you always hang with. Stay close to us, you know. Don’t get very far away from the way we do things at any time.